The Zero Tolerance Tanto Folder Knife, model 0700 has an extra wide blade that gives the point even more support than the traditional Tanto point blade. The blade is made from S30V stainless steel and has plenty of cutting real estate with it’s plain edge. 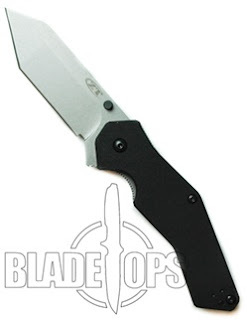 This knife is lighter than you would expect from such a decent sized folder–mainly because it has G10 handles. It also comes preequipped with a removable pocket clip that is set up for tip up pocket carry. The knife is easy to open using the thumb stud on the blade. Comfortable to hold, lightweight, and tons of cutting strength are the highlights of this great new folder from Zero Tolerance.